I shall depart from my normal and usual pattern and read portions of my presentation because I want to state temperately and accurately the doctrinal principles involved and to say them in a way that will not leave room for doubt or question. I shall speak on some matters that some may consider to be controversial, though they ought not to be. They are things on which we ought to be united, and to the extent we are all guided and enlightened from on high we will be. If we are so united—and there will be no disagreement among those who believe and understand the revealed word—we will progress and advance and grow in the things of the Spirit; we will prepare ourselves for a life of peace and happiness and joy here and now, and for an eventual eternal reward in the kingdom of our Father. There is a song or a saying or a proverb or a legend or a tradition or something that speaks of seven deadly sins. I know nothing whatever about these and hope you do not. My subject is one about which some few of you, unfortunately, do know a little. It is “The Seven Deadly Heresies”—not the great heresies of a lost and fallen Christendom, but some that have crept in among us. Now I take a text. These words were written by Paul to certain ancient Saints. In principle they apply to us:I hear that there be divisions among you; and I partly believe it. Heresy two concerns itself with the relationship between organic evolution and revealed religion and asks the question whether they can be harmonized. Of those in the telestial world it is written: “And they shall be servants of the Most High; but where God and Christ dwell they cannot come, worlds without end” (D&C 76:112). These two principles are (1) that this life is the appointed time for men to prepare to meet God—this life is the day of our probation; and (2) that the same spirit which possesses our bodies at the time we go out of this mortal life shall have power to possess our bodies in that eternal world. 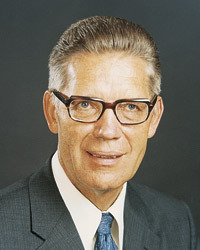 God grant that we may be wise in what we do, that we may seek truth, that we may live in harmony with the truth, that we may bear testimony of the truth, and that we may, as a consequence, have joy and peace and happiness here and now and be inheritors, in due course, of eternal reward in our Father’s kingdom. This is my prayer for myself and for all of you, and for all of the members of the Church, and for honest truthseekers everywhere, and I offer it in the name of the Lord Jesus Christ. Amen.